Habit: Perennial herb, cespitose, rhizomed. Stem: ascending to erect, solid; nodes generally hairy. Leaf: ligule membranous, ciliate-fringed; blade firm, flat to inrolled, sharply acute. 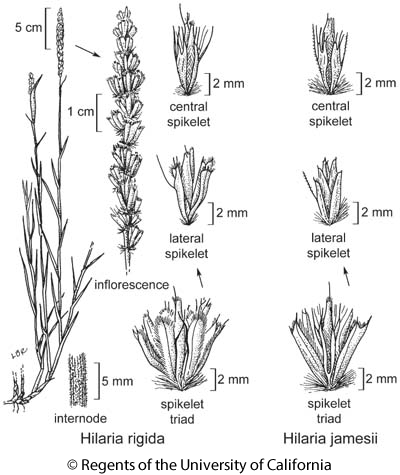 Inflorescence: spike-like, generally cylindric; spikelets in clusters, 3 per node, +- equal; clusters wedge-shaped, overlapping, ascending to appressed, hairy-tufted at base, falling as 1 unit from zigzag axis; glumes of cluster together involucre-like. Central Spikelet: subsessile, appressed to or nearest inflorescence axis; glumes equal, < floret(s), oblanceolate, keeled, ciliate, tip deeply 2-lobed, lobes lanceolate, awns 3--9, 1 from +- mid-keel, others terminal; florets generally 1--2, lower floret bisexual, upper floret (if present) bisexual or staminate; lemma lanceolate, 3-veined, generally ciliate, tip generally 2-lobed, generally 1-awned +- from sinus; palea +- = lemma.Lateral Spikelet: sessile; glumes < to +- = florets, ciliate, lower glume asymmetric with 1 awn from +- middle near margin, generally 2-lobed, lobes unequal; florets 1--4, generally staminate; lemma 3-veined, tip generally ciliate; palea +- = lemma. Habit: Plant 3.5--10 dm, branched above base, generally bush-like. Stem: 1.5--3.5 mm diam at base; node hairs curly. Leaf: generally cauline, generally sparsely to densely tomentose, especially near and sometimes overlapping ligule; ligule membrane < 1 mm, lateral teeth 0; blade < 10 cm, 2--4 mm wide. Inflorescence: 4--10 cm; spikelet clusters 7--11 mm. Central Spikelet: glume margin hairs 0.5--3 mm; lower lemma tip sometimes 4-lobed, awns 3, +- from sinuses, central awn 2--5.5 mm.Lateral Spikelet: lower glume with 1+ subsidiary lobes, or larger lobe tip fringed, awns 2--4; upper glume tip with 2+ lobes or fringed, awns 1--3, 0.4--2.5 mm, margin hairs 0.5--2 mm; lemma tip 2-lobed, awn 1 +- from sinus, 0.4--2 mm, margin hairs 0.2--1 mm.Chromosomes: 2n=18,36,+-108. Ecology: Common. Dry, open, sandy to rocky slopes, flats, and washes, sand dunes, scrub, woodland; Elevation: < 1600 m. Bioregional Distribution: PR, e&s DMoj, DSon; Distribution Outside California: to Utah, northwestern Mexico. Flowering Time: All year Note: Important forage; some plants from eastern DMoj and Ord Mtn (San Bernardino Co.), with +- straight internode hairs, intermediate to Hilaria jamesii. Citation for this treatment: J. Travis Columbus 2012, Hilaria rigida, in Jepson Flora Project (eds.) Jepson eFlora, http://ucjeps.berkeley.edu/eflora/eflora_display.php?tid=28274, accessed on April 19, 2019. PR, e&s DMoj, DSon; Markers link to CCH specimen records. Yellow markers indicate records that may provide evidence for eFlora range revision or may have georeferencing or identification issues. Purple markers indicate specimens collected from a garden, greenhouse, or other non-wild location.